A Barnsley Historian's View: What Happens to Jane Lewin? Died or Divorced or Something Else? What Happens to Jane Lewin? Died or Divorced or Something Else? When I first found Minnie Pagett marrying Henry Lewin in 1898 I probably believed what it said on their marriage certificate. I added it to the OH's family tree in 2009 after my great break-through which I related in my two posts about his great grandmother Edith Alice, here and here. Henry Lewin is 37 years old and says he is a bachelor, Minnie is 26 years old and says she is a widow. Odd now I look back at it that an older unmarried man would marry a young single mother . My theory was that Minnie said she was a widow to explain the babe in arms that was Edith Alice, no more than two months old at the time. Since then I have worked out that Henry was fibbing too! He had been married long enough to produce two sons, William and Albert, who are living with him and his first wife Jane in Stanley, Derbyshire in 1891. This means that when Henry married Minnie he had at least two small sons for her to take care of in addition to her own child. That makes more sense actually, I assumed for a long time that Jane had recently passed away in 1898 and that Henry had remarried to obtain a housekeeper and child care. But why did he say he was a bachelor? Following the email from a Lewin relative the other night I started looking back into Henry's history. As he is not a direct ancestor of the OH this is not something that I had done before. My correspondent noted that Henry and Jane had married in 1887 in Wales ... Oh dear, I had them down as marrying in early 1888 in Nottingham because, as you can see above both say they were born in Hertfordshire and William was not born until late 1888. I had missed the clue that William was born in Wales! So this is the marriage I should have put in the OH's tree. Henry's first wife's surname at the time of this marriage was Symons. I was able to cross check this using the new online GRO indexes. William James Lewin was born in the September quarter of 1888 in the Neath Registration District and his mother's maiden name was Symons. Great, a match, well done me! Sadly things do not continue as straightforwardly. Searching using the criteria of surname Lewin and Symons as the mother's maiden name I found a boy, George Henry, born in the Merthyr Tydfil District in Q4 1889 and another, William John, born in the Penzance District in Q2 1891. Umm, probably not both the family I am looking for as they wouldn't have two sons called William. It seems there was another Lewin/Symons marriage in Yarmouth in 1884. I must take that into account. A child called George Henry Lewin dies in the Pontypool District in Q4 1896 aged 7 years (or possibly months, you have to be careful with the GRO indexes as this can be an error with the transcriptions). But no, FreeBMD concurs, he was 7 years old. So where was he in 1891 when Henry and Jane were in Derbyshire? Staying with grandparents or other relatives maybe. A search of the 1891 census on Ancestry has not turned up any stray 2 year old children called George Lewin, so I am a bit baffled by this. We also know that Henry and Jane have a 9 month old son in the 1891 census, Albert E Lewin born in Derbyshire in 1890, but I didn't find him in my search with Symons as mother's maiden name. Ah, here he is. The only record that fits is for Albert Edward Lewin, born Q3 1890 in the Shardlow District, mother's maiden name James! Err .... what, this can't be right. To check this I went back to first principles and looked at the actual images of the pages of the 1887 GRO marriage indexes to make sure there wasn't a misprint in the Volume and Number. But no, both Henry Lewin and Jane Symons are Q3 Pontypridd 11a 597 as FreeBMD states. Two Jane James do get married in Wales that quarter, but neither in Pontypridd. Does this mean Henry married two girls called Jane? One called Symons and one called James? There is no evidence on FreeBMD that Henry Lewin ever married anyone with the surname James but it could have been her maiden name and Symons was a married name. They then declared Symons for William by mistake and put it right for the rest of the children. Or really bad handwriting! Ok, there are no Jane James born in Hertfordshire in 1867 or thereabouts so the stated birthplace on the 1891 census must have been an enthusiastic ditto mark. There are lots born in Wales, far too many guess which is the right one. I couldn't find a Jane James marrying anyone called Symons. Sometimes when I get really stuck I start looking at other people's family trees on Ancestry. You should never depend on other people's research until you have double checked it for yourself, but a clue or a point in the right direction can often break down a brick wall. There are at least ten uploaded family trees for Henry Lewin born 1861 in Hertfordshire and they all have him marrying Jane James in 1887. How can they all have ignored the evidence of the marriage indexes? And why has no-one sent for the certificate! Each tree of the trees shown here have Henry marrying Jane James in 1887 and Minnie Paget in 1898. They are all a little confused by Minnie's two Lewin daughters (I'm not surprised) as seen on the 1901 census. Three of the trees show that Henry and Jane have five children scattered across England and each tree shows all their exact birth dates but doesn't give sources for these. So somebody somewhere knows more than they are sharing online. Then suddenly Jane apparently remarries in September 1898 to a Joseph Traunter in Warwickshire and goes off to have more children by him, while Henry is simultaneously getting set up with Minnie in Wakefield. It is impossible to see which of these trees is the original, they are so similar they must have copied each other. I suppose with a slightly shady tree (ha!) like this the family members are probably being cautious about sharing official documents. Alice born in 1894 in Nottinghamshire - there's an Alice Lewin born in Basford District in Q4 1894 mmn Symonds according to the GRO. Arthur born in 1896 Coventry - could be the Arthur born in Tamworth District in Q4 1896 mmn Simonds. Tamworth was on the border with Warwickshire and could have included some parts of Coventry. There is another Arthur born Q1 1896 in the Coventry District but he clearly turns up in 1911 still in Coventry with parents Alfred George Lewin and Margaret. The search for Arthur Lewin born 1896 turned up links to a CWGC (Commonwealth War Graves Commission) gravestone picture from Pontefract Cemetery. It gives details a man in the King's Own Yorkshire Light Infantry who died on 12 October 1916 aged 20. You know how I like a WW1 soldier, so I do hope he's related! That takes me back to the email I got from the OH's distant relative. 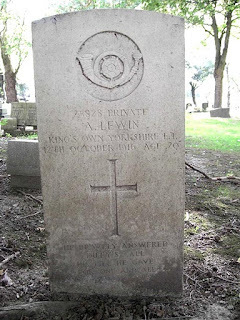 She mentioned that Albert Edward Lewin was killed at the Somme in 1916. I had not previously taken any notice of Albert (b.1890 in Derbyshire) as he doesn't appear on the 1901 census in Wath on Dearne after Henry is married to Minnie although older brother William does. A search of the CWGC index for these two names gives a few clues. Arthur Lewin's entry tells us quite plainly that his mother was Jane Traunter (formerly Lewin) and his father was the late Harry Lewin. This fits with the entries on the online trees which state that Jane Lewin remarried to Joseph Traunter. Albert Edward's entry is not so helpful. But it does partially confirm what my correspondent said. Striking out now to try to find out how Jane (Symons or James, later Traunter or Tranter) managed to get herself from Derbyshire to Castleford via another marriage in Warwickshire. In 1911 she is living at 18 Wainwright Yard in Castleford with Arthur Lewin born in Tamworth, Warwickshire in 1896/7 , which fits the CWGC record. She says she is 44 years old, which makes her born in 1867 which tallies with the 1891 census. She was born in Inurthys (?) Glamorgan. She has been married for 13 years, so that agrees with the Online Tree suggestions of 1898. She has had six children to this marriage but only two are still alive. Other children in the household are eighteen year old Eliza Lewin, born in Trimedon, Durham (fits the other children mentioned by the online trees), twelve year old Clara Traunter born in Bedworth, Warwickshire and five year old Walter Traunter, born in Castleford. I was able to find an entry on FreeBMD for a Jane James marrying Joseph Tranter in Q3 1898 in Foleshill District, which is in Warwickshire and contains Bedworth where Clara was born in Q1 1899. Backtracking to 1901, which was quite a task, I found this entry for the O'Riley family. The names and ages of the children and their birth counties fit with the 1911 census, plus we have Albert Edward, born in Derbyshire and Alice born in 1894/5 in Nottinghamshire also present. I had commented that he wasn't with Henry Lewin in 1901 - because he was with his mum in Castleford. Jane now gives her age as 40 and says she was born in Cardiff, which is in Glamorgan. But who on earth is Michael O'Riley, aged 54 and born in Ireland, to whom she is apparently married? And where has Joseph Tra(u)nter gone? Was this just an alias? The age of the man matches the age of Joseph Traunter at his death in 1928 when he was buried from Paradise Gardens (the name for the workhouse in Pontefract). Jane Traunter is living in an Alms House in 1939 in Micklegate, Pontefract and dies from there in 1945. Bearing in mind that divorce was really not often possible for working people in the 1890s it seems that both Henry Lewin and Jane Lewin (nee Symons or James) may have been committing bigamy. Note that I say 'may'; if anyone has proof of a different version of this story please, please get in touch. As there are so many Online Trees I assume there are lots of descendants of Henry, Jane, and Joseph who are all trying to resolve these questions.